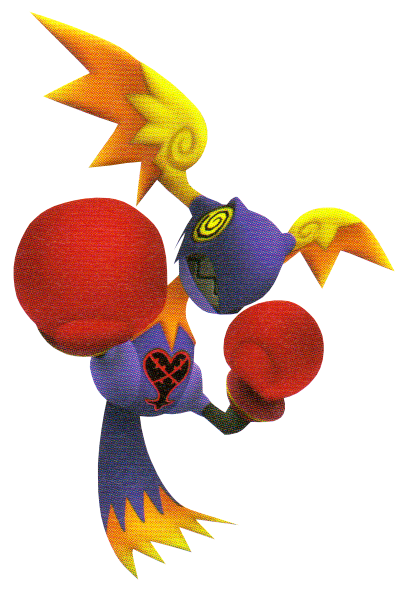 The Aerial Knocker is an Emblem Heartless that is found in Kingdom Hearts II. An Aerial Knocker is a parrot-like creature with predominantly violet plumage. Its round head, including its beak, is also violet, though the tips of its tail feathers and its neck are orange. Its eyes are large, black and yellow spirals on either side of its head. The Aerial Knocker's wings are yellow and orange and sprout out of the top of its head rather than from its back or sides like real-world birds. Its legs are black and it wears a large, red boxing glove on each one. Its Heartless emblem is on its abdomen. 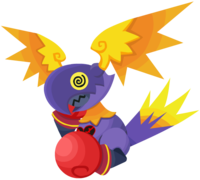 In Kingdom Hearts II Final Mix, the violet plumage on the Aerial Knocker becomes grey, its neck and the yellow parts of its wings become white, and the orange plumage in its tail and wing feathers become a lighter shade of orange. Its boxing gloves also change to blue. The Aerial Knocker's name references its flight, as well as its boxing gloves. "Knock" can mean "to impact" or "to strike". The Reaction Command for the Aerial Knockers is Rapid Blow, which is a speedy attacking charge similar to the Aerial Knocker's own attacks. This Reaction Command is only available when Sora is in Lion Form. The Aerial Knocker's main attack is punching. Although Aerial Knockers are generally weak, they tend to appear in packs, and has many vicious punch combos. They tend to dodge until they attack with multiple jabs. 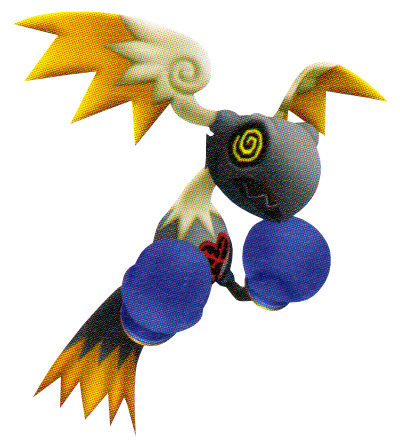 Magnet followed by Thunder is a quick way to defeat large groups of them, although if there is one alone, a single aerial combo with a strong Keyblade such as Decisive Pumpkin or Hero's Crest is enough to take it out. If you get surrounded, Reflect is also a viable option as it deals high damage and has a large area of effect.